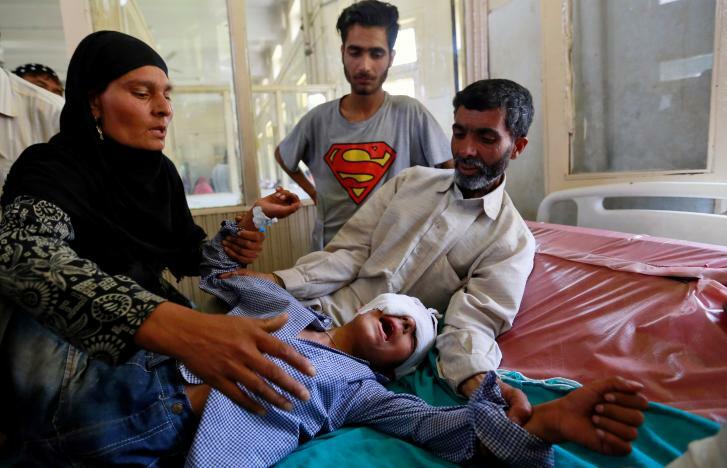 People with severe injuries are about to be treated at the main Indian-administered Kashmir hospital as consequence of last clashes between protesters and security forces in Kashmir. Patients report severe injuries on their body and affirm to have been beaten by security forces in their own houses. By now, 65 people have been killed and 6,000 injured, many of them by shotguns. At Srinagar main SMHS Hospital there are many paeople wounded on their back, wounded at the eyes and on their face. The boy on the main photo has been wounded by shotgun pellets at the head, covered in bandages, and comforted by his family. Human rights activists affirm the responsible for excessive violence are rarely brought to justice. There is another problem which makes more difficult the situation inside the hospital. Doctors are in physical and mental stress caused by emergency and urgent cases. According to Nisarul Hassan, senior consultant at SMHS Hospital, they had performed more eye operations in the past month than they had over the last three years. Plus, volunteers and paramedics affirmed Government forces attacked them on the way. Kashmir is at the centre of a decades-old rivalry between India and Pakistan, which rules a northwestern section of the divided region, and backed an insurgency in the late 1980s and 1990s that Indian security forces largely crushed. A U.N. human rights official has expressed “deep regret” at the failure of both India and Pakistan to grant access to the separate parts of Kashmir that each runs to investigate allegations of serious human rights violations.